I’ve always found it a bit tricky at first to talk about holidays in Chinese. The Chinese holidays involve these things that we just don’t have, so it’s not a matter of translation, it’s a matter learning what these things are and what they’re called. 红包, 粽子, 对联, 扫墓, etc. Fortunately, that’s a pretty interesting learning process most of the time (especially if you’re learning the stuff hands-on in China), so all is well and good there. And then there’s explaining the western holidays to the Chinese. Sure, the Chinese already know a lot about western holidays, so frequently all you have to do is fill in a few of the gaps. The fun part of figuring out where the gaps are, and what misperceptions there are. I’ve always enjoyed this too. 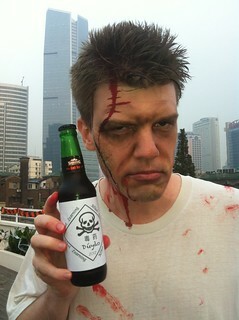 Halloween (万圣节) seems to bring a few of its own challenges, however. The concept is easy for the Chinese to get: it’s a 鬼节 (a “ghost festival”). It’s the trivial things that tend to pose challenges here. How would you say the following in Chinese? – What are you going to be for Halloween? – Don’t forget to wear a costume. – Why didn’t you dress up? – 你要穿什么？ This one is a little vague, because it just asks “what are you going to wear,” which might apply to any party. My wife and I dressed up as Amy and Rory fighting “the silence” (from Doctor Who), and the only Chinese person I know that “got it” was my writing class TA (who is an English major). Just for the sake of being pedantic, but surely Hallowe’en, All Hallow’s Eve, is 万圣节前夕, and today, November 1, All Saints’ Day, is 万圣节? Chis Waugh you are totally right and that issue needs to be addressed. It seems like someone was being lazy along time ago or just some person who didnt understand English well enough came up with the translation. For what it’s worth, I’ve always used the verb “扮成” to refer to “dressing up” for Halloween.